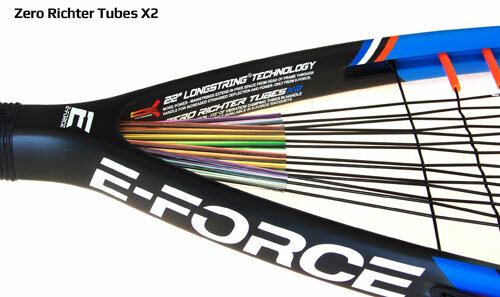 E-Force Power Technologies are for the total power racquet! 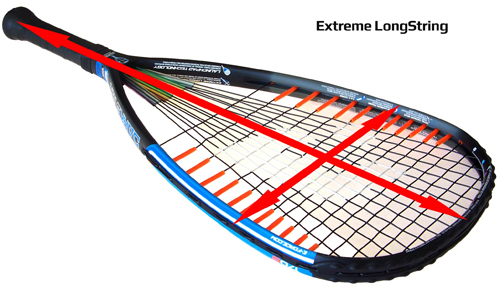 •Extreme LongString – All strings are as long as possible in free space for maximum power storing string bed deflection over the entire strung surface. 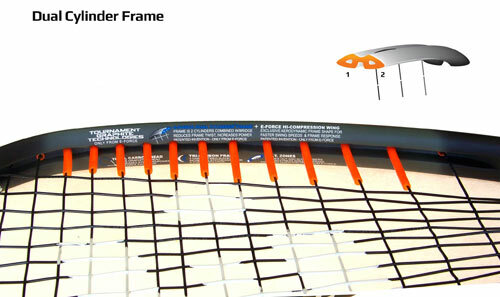 The cross strings extend to the frame’s outside perimeter; while the mains extend from the racquet tip entirely through the hollow handle. Massive power. 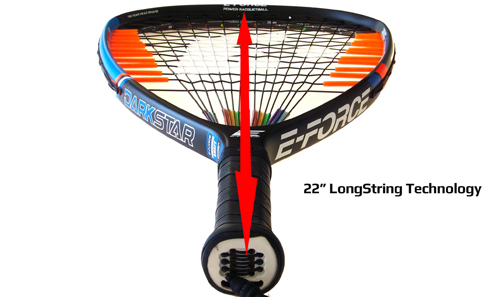 •22" LongString – All 14 mains extend in free space from head though the entire hollow graphite handle allowing deflection along the entire length of the frame for even more power. 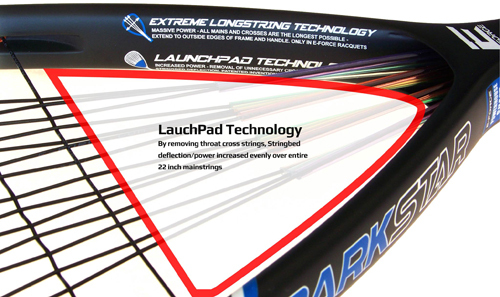 •Launch Pad Technology – More power and evenly distributed power response is created by eliminating deflection distorting throat area cross strings. Stringbed deflection is increased and more proportionately distributed along the entire 22 inch stringbed. 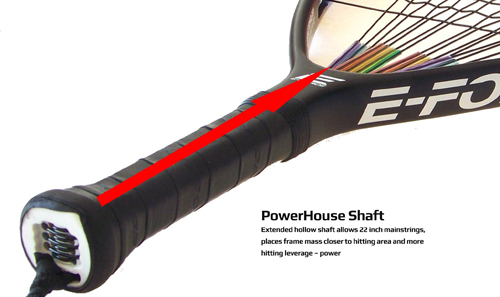 •PowerHouse Shaft – Hollow shaft adds power without reducing 22 inch mainstring length; placing frame mass nearer to the hitting surface. 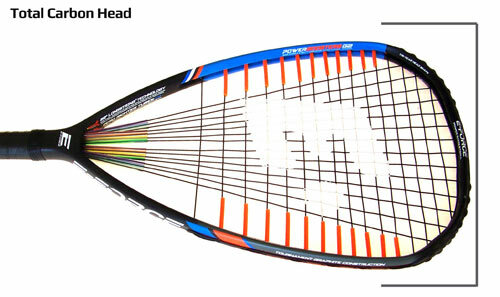 Also provides more hitting leverage and power while allowing strings to extend through the racquet’s full 22 inch length. E-Force racquets have exclusive patented Vibration damping technologies which give the racquet frame a consistent, solid and even stringbed resulting in more accurate shots and increased ball control. 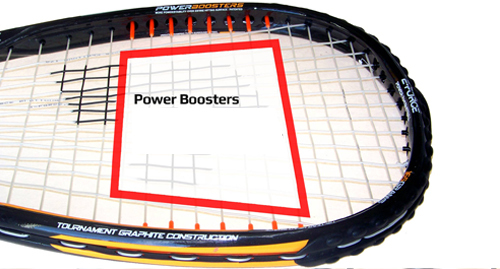 No other racquets in the market have these vibration reducing technologies! 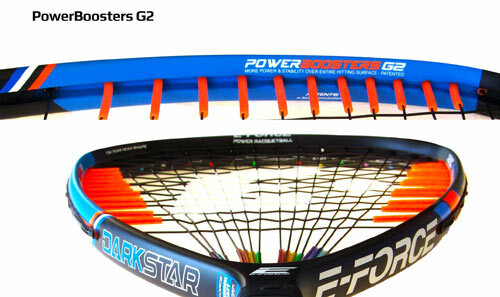 •G2 Power Boosters - The string bed is stabilized and vibration reduced by 32 inches of large diameter Booster Tubes strategically placed on both ends of 11 cross strings. Power is maintained and points scored on even off center hits. •Zero Richter Tubes X2 – The 14 mains are each encased in 9.5 inches of flexible “Richter Tubes” hidden in the handle and extending onto the lower throat area strings. Totaling over 10 feet, the tubes minimize vibration to just the right amount for the necessary touch to keep you in control. 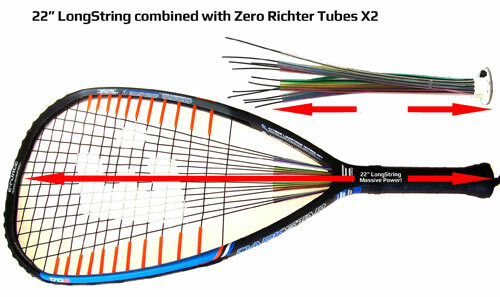 •22" Longstring combined with Zero Richter Tubes X2 – The 22” mains extending through the handle create tremendous power. The vibration associated with that power is reduced to the minimum desired by addition of the associated 10 feet, or 9.5 inches per string, Zero Richter Tubes. The “tubes” also dramatically facilitate re-stringing through the handle. 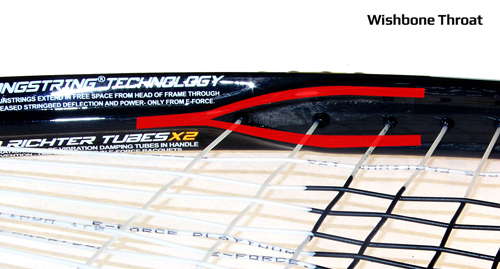 Patented durability technologies to keep your racquet on the court longer! •Dual Cylinder Frame – Exclusive graphite two cylinder frame (rather than one) connected by a thin graphite bridge at the frame’s outer edge. Increased durability while reducing frame twist and distortion transferring more power to the ball. Strings anchored at bridge’s outside edge for greater string length and power. •Hi-Compression Wing – Thin aerodynamic frame shape with super thick durable frame tube walls. Fast, quick, maneuverable and more durable. •ByPass Stringing System – Exclusive graphite two cylinder frame (rather than one) connected by a thin graphite bridge at the frame’s outer edge. Increased durability while reducing frame twist and distortion transferring more power to the ball. Strings anchored at bridge’s outside edge for greater string length and power. The E-Force hi-performance racquets are each made up of over 50 individual graphite pieces that are molded into a single frame structure using high temperature and pressure. These parts vary in size, shape, stiffness, weight, fiber direction and specific type of graphite material. Each graphite piece is designed, engineered and manufactured so all 50 plus parts are specifically and strategically placed. The result is every inch and segment gives you optimum stiffness, flexibility, balance, weight, maneuverability and durability. Every court advantage is yours! 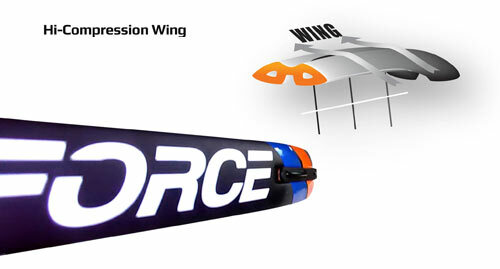 Additional Patented technologies to keep your E-Force racquet dominating on the court! •Power Trac Frame – Two structural fins on the frame’s inside surface increase power and control by adding stiffness and reducing frame distortion, twist and torque. Waste motion is decreased and more power is transmitted directly to the ball. •WishBone Throat – The three part structural fins in the inner throat area reduce throat twist and torque, resulting in increased power, control and shot accuracy. •Power Booster G1 – E-Force's breakthrough Power Booster technologies. Both ends of the 7 sweetspot cross strings are surrounded by a total of 14 inches of vibration reducing and frame stabilizing tubes. Vibration is reduced and the stringbed more stable even on off center shots. •Monster String Holes – 2.53 sq. cm. 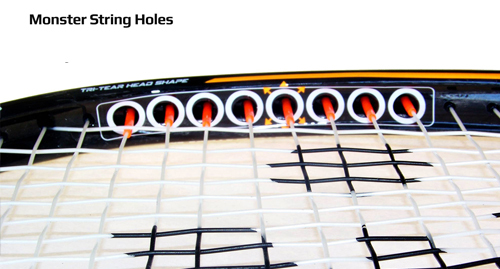 holes allow sweetspot main and cross strings to extend in free space to the outside edges of the frame. 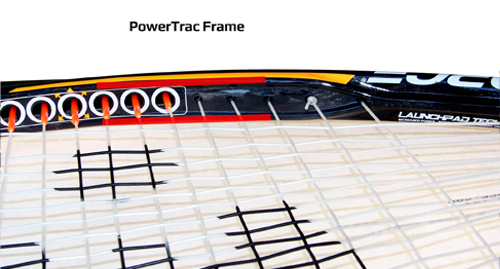 The strings are effectively longer resulting in greater stringbed deflect and further increasing power.